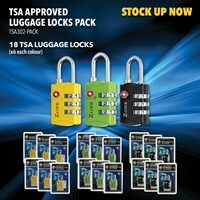 This pack contains x6 of each colour (Green, Black & Yellow) of the TSA approved Zone luggage locks. Each padlock has a cast metal body with a colour lacquer finish. This range comes with a 10 Year Guarantee.